Wolverhampton will come together to mark Remembrance Sunday - and the 100th anniversary of the end of the First World War. The city's annual Observance of Remembrance will be held at the Cenotaph in St Peter's Square on Sunday November 11th, 2018. The Parade will include detachments from ex-Service, Regular, Reserve, Cadet Units and representatives of other local uniformed organisations starting at 10.10am. 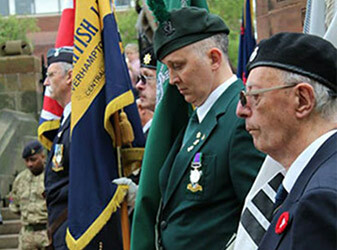 Going via Prince's Square, the parade will travel along Lichfield Street to Queen Square, right onto Exchange Street and across Cheapside to St Peter's Square, where a Drumhead Service - the traditional form for a religious service attended by troops in the field - will begin just before 11am. This will be followed by a second service in St Peter's Collegiate Church. Members of the public are encouraged to attend and the Mayor of Wolverhampton said: "The annual Observance of Remembrance is an opportunity for everyone in Wolverhampton to pay tribute to the men and women of our Armed Forces, past, present and future.